We have seen how Reality has been described as Sachchidananda --a triune of Existence-Consciousness-Bliss. Bliss or ‘Self-Existent Delight’ is the very nature of Reality. However, this ‘Ananda’ or Self-Existent-Delight cannot be ordinarily felt, as it is entirely different from our usual emotional and sensational pleasure. One can infer it philosophically, metaphysically because it is the only plausible answer to the ‘why’ of existence and the only valid reason why we ‘cling’ to life despite all adversities. Nevertheless, it is something ‘utopian’ to ordinary life. The one breast meant eternally for her. Of nearness to one dear familiar shape. And soft glad things cluster around my name. And the young mother’s passionate deep look. And passion blind as death and deaf as swords. This is the God of Love! These are his gifts! The drama of life needs a pot-pourie of emotions to keep the show going. If we cannot emotionally perceive ‘Self-Existent Delight’, can we ‘cognise’ it at the level of our outer mind? This also appears impossible. Our ordinary mind is characterized by doubts, preferences, and biases. It cannot take anything for granted. Its standards are always set and reset. Its expectations always need to be exaggerated. And if unfortunately, the ‘mind’ becomes the mind of a paranoid subject, his object of paranoia -- his focus of delusion is very often his most loved persons (his spouse or friends). Can then the ‘body’ or our outer physical consciousness, experience the Self-Existent Delight? After all, it is the ‘body’ that thrills with rapture when it has an experience of sensual pleasure. But all sensual pleasures are transient despite all vulgar efforts at stimulation . One must not forget that the culture of hedonism made the body react with responses like HIV! DO NOT TRY TO COME INTO DIRECT CONTACT WITH DIVINE LOVE BECAUSE THIS WILL YET AGAIN BE A VITAL DESIRE PUSHING YOU; YOU WILL PERHAPS NOT BE AWARE OF IT, BUT IT WILL BE A VITAL DESIRE. negative currents. Subconscient in Matter, superconscient beyond Mind this delight seeks in Mind and Life to realise itself by emergence in the becoming, in the increasing self-consciousness of the movement. Its first phenomena are dual and impure, move between the poles of pleasure and pain, but it aims at its self-revelation in the purity of a supreme delight of being which is self-existent and independent of objects and causes. 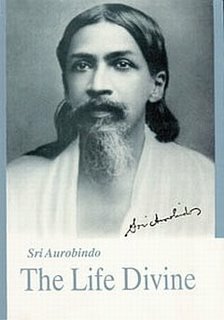 Just as Sachchidananda moves towards the realisation of the universal existence in the individual and of the form-exceeding consciousness in the form of body and mind, so it moves towards the realisation of universal, self-existent and objectless delight in the flux of particular experiences and objects”. I have looked, alive, upon the Eternal’s face.